This kitty cozies up in a warm down comforter. As nights get colder and darker, now is the perfect time to make your bed warmer. It’s time to lose the breezy cotton sheets and lightweight blankets, and bulk up a bit. So what is the warmest bedding to use? Here are some ideas for making your bed the coziest, most inviting place in the house. Start with the basics, a mattress pad. A mattress pad is the very first thing you put on your bed and rarely do you think about it offering warmth. However, heated mattress pads can offer more comfortable and efficient heat than a heated blanket. A heated mattress pad can feel good on sore joints and no heat escapes out the top. All the heat is trapped under the blankets and near your body. Next, add flannel sheets. Thick flannel sheets offer soft warmth and comfort on a cold night. Soft flannel will help hold heat next to your body, but still offer breathability. On top add a layer of insulation. Choose blankets and comforters made from insulating materials. Down, synthetic down, and wool are all excellent choices. These materials will trap heat in your bed and prevent the cold outer air from seeping in. Wool has the added benefit of wicking moisture away from your body which will also help you stay warm at night. When choosing your bedding, keep in mind that materials like down and wool will require extra care when cleaning. Protect your comforters using a duvet. Also, if you suffer from allergies, you may want to choose a synthetic material instead. Remember that layers are also key to staying warm. Add extra blankets to your bed and you can always kick them off if you start to feel too warm in the night. Having a nice warm bed at night means you can comfortably turn down the thermostat and save energy during the night. It also means you can sleep restfully and not wake up because you are too cold or too hot. Get your bed ready for winter and cozy up to cooler nights. What are your favorite winter linens? 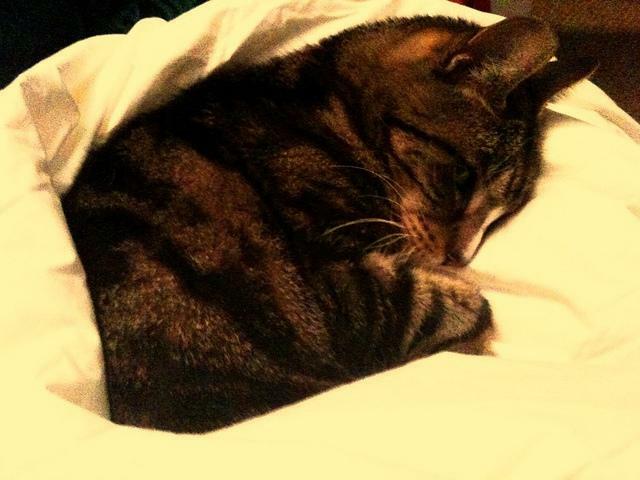 Image: “Jacques loving the new down comforter” by Jessica Rossi.